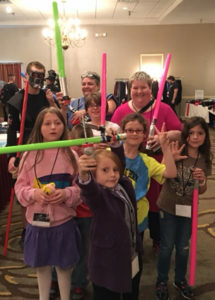 Reaching out to the younger generations of fandom is very important to all of us here at RavenCon. We take extra pride in putting together our Kids’ Programming every year. SHIELD agent training. Special craft projects. Pizza parties. Writing workshops. Ghost stories. Laser tag. Jedi training. These are some examples of things we’ve done in the past. We don’t know what’s in store for this year yet, but I just know it’s gonna be fun! Here’s what our Kids Programming Schedule looked like in 2017. We’re already looking forward to 2018! Posted on September 5, 2015 by ravenchair.